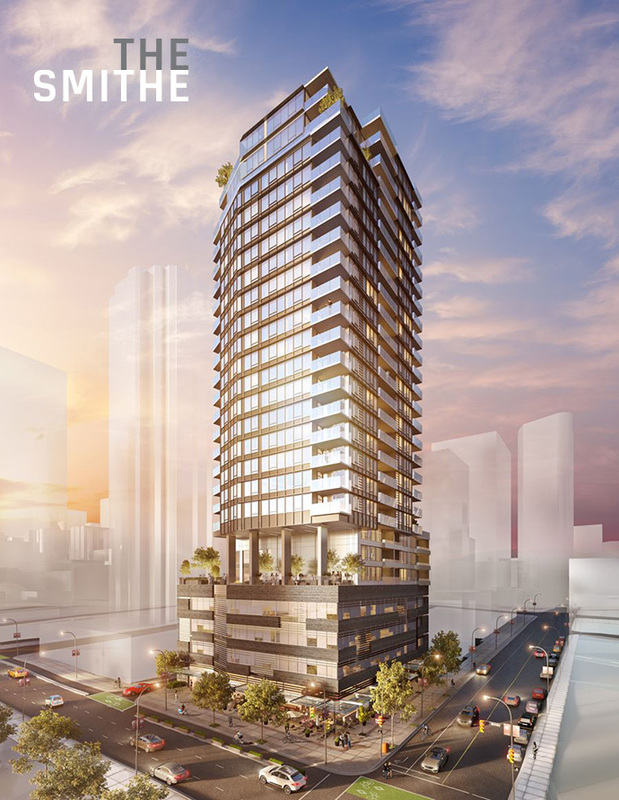 The Vancouver Condo Buzz » THE SMITHE Vancouver Downtown Condo Tower by Boffo Launching Soon! NOW PREVIEWING! 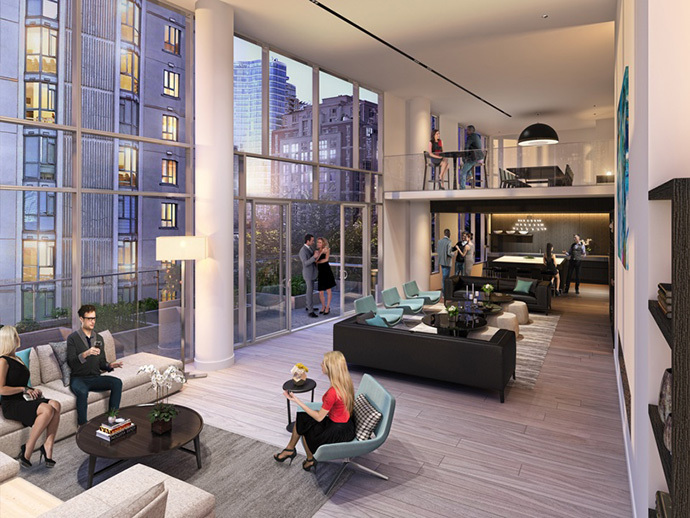 Refined City Living is available in downtown Vancouver at The Smithe condo tower. Thoughtfully designed 2 and 3 bedroom condominium residences starting from 1,000 square feet are available at The Smithe Vancouver. Elegant interiors are designed with an obsession for detail to create an unprecedented living experience for home owners. The Smithe by Boffo Developments Ltd is a rare opportunity for those who want spacious downtown living in a central location. The 6,000 square foot sales gallery with 1,400 square foot display home is now open by appointment only at 1035 Seymour Street Vancouver. Some of the words used to describe the Downtown Vancouver Smithe condo tower include: elegant, graceful and imbued. 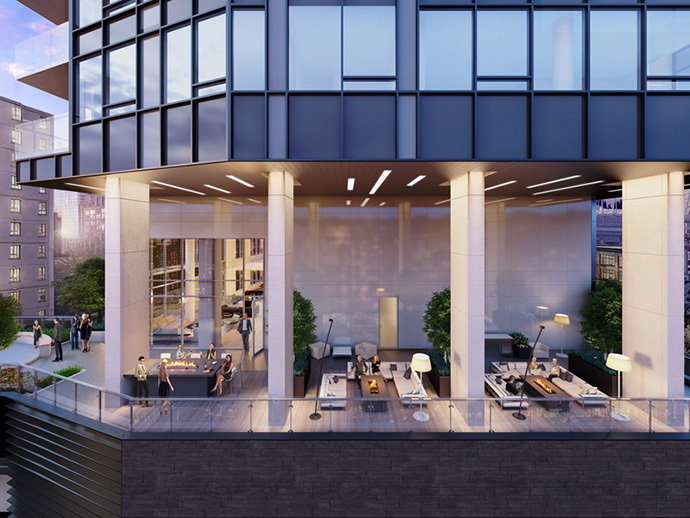 Ideally situated between the trendy Yaletown District and the new downtown Crosstown neighbourhood, The Smithe Vancouver is the most highly anticipated highrise residence to hit the market in 2017. The location is right in the centre of the Arts and Events District and you will be within walking distance to theatres, galleries, cultural venues and much more including the Queen Elizabeth Theatre, Orpheum, Scotiabank Dance Centre. You’re also within close walking distance to BC Place Stadium and Rogers Arena, the water, Cambie Street bridge corridor and award winning restaurants and great dining spots. The interiors of the pre-construction Vancouver Smithe condos are exquisite, with honed natural stone floors throughout, Sub-Zero and Wolf appliances including an integrated wine temperature controlled storage system, imported custom Italian cabinets by Binova and ensuites with frameless glass showers, flush set composite stone slab basin and under lit dual vanities. The interior design is by award winning firm Trepp Design Inc. The exterior of The Smithe Vancouver Downtown condos references the heritage of the nearby historical buildings from the early 1900’s. More information is online at www.thesmithe.ca or you can simply register your interest by filling out the online form at the top of this page. A one-of-a-kind centrally located downtown tower is coming soon. It’s called The Smithe by Boffo. Here, homebuyers will find contemporary homes with timeless design and meticulous attention to every detail. The sales gallery and display home is now open and features 1,429 square foot home and over 38 feet of expansive windows overlooking impressive views of Yaletown and False Creek. 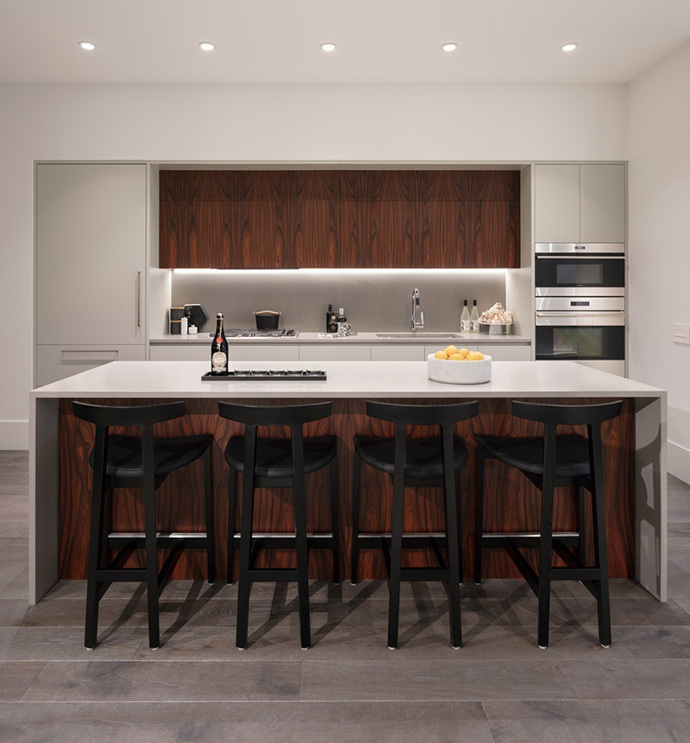 The honed natural stone floors are fabulous as are the kitchen features and finishes which include custom built Binova cabinetry, concealed appliances and functional upper cabinetry! The Smithe Vancouver luxury homes will also feature high-end Sub-Zero and Wolf appliances, a temperature controlled wine storage system, beautiful kitchen islands for food prep and entertaining and so much more. 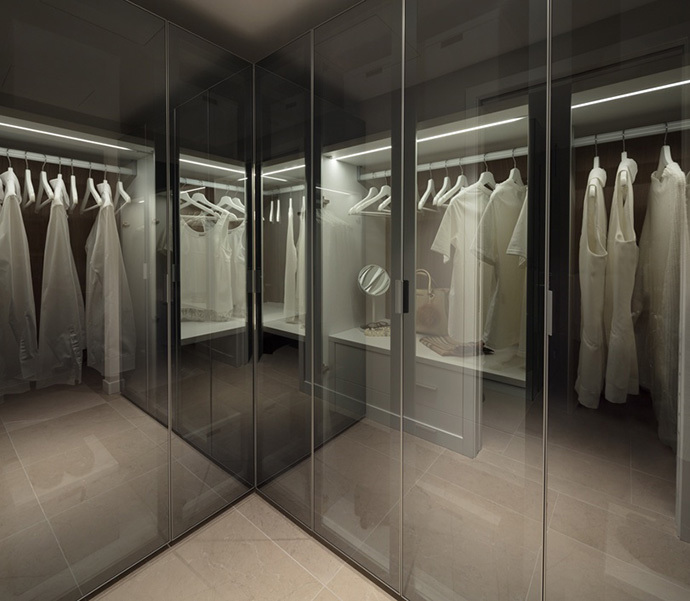 The bedrooms are spacious with dream closet systems, automatic light sensors and more. 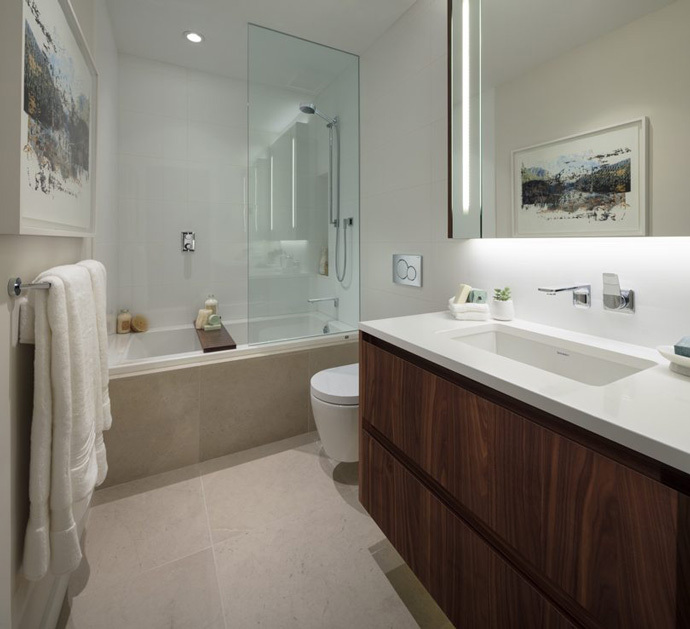 The bathrooms are elegant and beautiful and will feature such things as frameless glass enclosures, Dornbracht fixtures and composite stone basins. You’ll also find floating vanities and lots of storage space within these homes. The presale Vancouver Smithe condos also feature spacious outdoor living spaces that come with gas hook-ups for a BBQ or outdoor heater. The interiors are designed by award winning firm Trepp Design Inc and they’ave added dramatic and unique colour palettes for presale home buyers to chose from. The Smithe Vancouver presale condos will also feature a sixth floor podium level that has over 6,000 square feet of amenity space. Over 4,000 square feet of this includes indoor/outdoor lounge spaces, private dining room and a fully appointed fitness centre. Another thoughtful detail at The Smithe condos in downtown Vancouver is a bike only elevator that is separate of the regular pedestrian ones. That provides an easy entry and exit for those who bike to work or play. The Smithe by Boffo is located in the heart of what is now known as the Art and Entertainment District. It’s adjacent to Yaletown and Crosstown, and within close walking distance to the Central Business District, Waterfront Station, The Beach District, Chinatown and much more. Here you will find theatres, shopping, boutiques, cafes, galleries, and much more. From the Orpheum to QE Playhouse, to the Vogue Theatre, and from international cuisine and the Art Gallery, there is an abundance of cultural activities to experience. 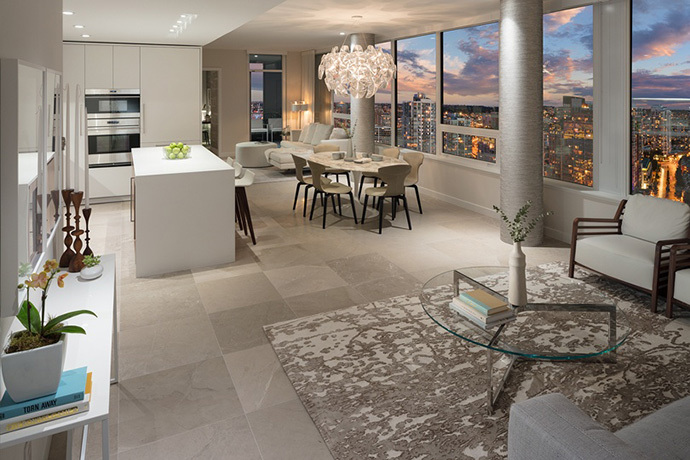 Located at 1035 Seymour Street Vancouver, The Smithe by Boffo Developments features hone natural stone floors, beautiful SubZero and Wolf appliance sets including a wine fridge and imported custom Italian cabinetry plus many other premium finishes and features. It’s right in the heart of the Arts and Events neighbourhood. 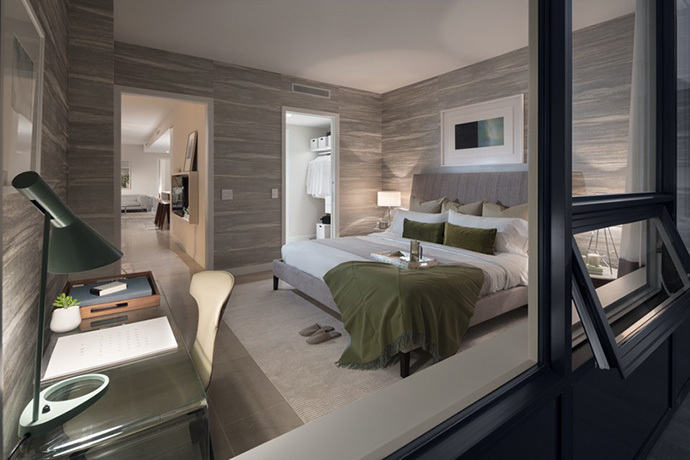 The Smith Vancouver condo presentation centre is now open by appointment and features a spectacular 6,000 square foot sales gallery plus a 1,400 square foot display home. Situated in the heart of the Downtown Vancouver Arts + Events District and intersecting the city’s best neighbourhoods, The Smithe offers you a world of amenities all within a walkable distance from home. One of Vancouver’s most amenity-rich communities is emerging here. Within steps of your new home at The Smithe are the city’s most renowned theatres and art galleries. Award-winning restaurants surround the area, as well as some of the finest retail shops. Everything is truly at your fingertips from this outstanding centralized location. STARTING FROM 1,000 SQFT! THOUGHTFULLY DESIGNED 2 + 3 BEDROOM RESIDENCES ARE COMING TO THE HEART OF DOWNTOWN VANCOUVER’S ARTS + EVENTS DISTRICT. STARTING FROM 1,000 SQFT, THESE ELEGANT INTERIORS ARE DESIGNED WITH AN OBSESSION FOR DETAIL TO CREATE AN UNPRECEDENTED LIVING EXPERIENCE FOR OUR HOME OWNERS.